When it comes to optimal economy and efficiency UIG ECO-COAT 973 Epoxy Coated Bolted Steel Tanks are the best answer for your water, waste water, chemical or dry bulk storage needs. 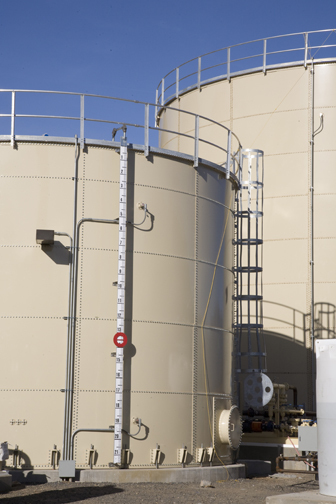 Epoxy bolted tank designs offer superior flexibility and secure leak protection plus far greater economy than any field-welded, field erected steel tanks. In addition, current overlapped-plate construction the leakage problems associated with the older flanged type tank designs. UIG manufactures bolted steel tanks that are built to last. The epoxy coated panels provide excellent corrosion resistance to a wide range of waters and other liquids. When UIG designs your epoxy tank, we take into consideration all of your needs for economy, scheduling and safety. Our years of experience allow us to design tanks for any special situation – heavy liquids, high wind factors, heavy snow loads or special seismic requirements. These tanks are designed for maximum efficiency, long life and excellent service and are exceptional for the storage of potable water, waste water, and other liquids. • Epoxy Coated Bolted Tank installation requires less field equipment and shorter turnaround labor resulting in considerable costs savings in comparison to welded or concrete tanks. • Epoxy panels are shipped in compact, manageable packages which reduce freight charges and allow easier handling on the job. • Bolted Steel Tanks are precision fabricated resulting in perfectly matched segments for safe, dependable storage. 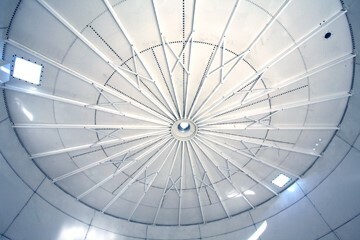 • Epoxy Coated Bolted Steel Tanks may be erected during normal operations because no flame or field welding is required. 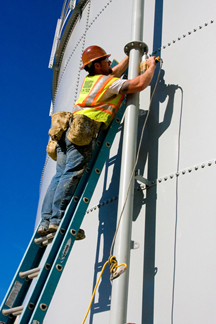 • Bolted Steel Tanks may be installed by local labor, eliminating high costs of delivery teams to remote locations. • Inventory is readily available offering fast delivery. • Factory applied coatings are available to meet all your requirements. • Bolted Storage tanks are economical to ship worldwide. Sizes to fit your available space – build it low and wide, high and narrow or any configuration necessary to meet your particular space and capacity requirements. May be installed outside on the ground, on elevated platforms or inside existing buildings. Flexible capacity: tank size can be increased or decreased by adding or removing a ring of panels. Bottom design may be flat, conical or other as needed. Deck options include: fusion bonded epoxy coated carbon steel, aluminum dome, fiberglass plastic trough or open top with bridges and necessary structures for waste-water treatment systems. Many accessories available to suit your project requirements – mixers, heaters, insulation, sonic level indicators, SCADA, cathodic protection and more. When it comes to dismantling and moving your tank, relocation is my easier and less expensive with an Epoxy Coated Bolted Steel Tank.